“The latest technology and automated elements we incorporated into this year’s Zimmer booth are more typical of a state-of-the-art arena-like rock show than what is normally seen on a trade show floor,” Evan Williams, CEO of Riverview Systems Group. Riverview Systems Group, the award-winning, full-service provider of engaging and innovative live events, is pleased to announce it is providing extensive production design services in support of long-time client Zimmer Biomet, the leading medical device manufacturer, for its exhibit presence at the American Academy of Orthopaedic Surgeons 2016 Annual Meeting (AAOS), taking place March 1-5 in Orlando, FL. Marking its eighteenth consecutive year collaborating with Zimmer at the AAOS, the most important industry event attended by over 15000 orthopaedic surgeons and allied health professionals, the Zimmer Biomet exhibit at AAOS is the largest at the show -- a 19,000 square foot, two-floor exhibit booth (complete with conference rooms and demonstration labs) -- and features a 16’ x 48’, 6-section automated LED wall that moves together and breaks apart depending on specific content, as well as an immense lighting rig akin to an arena rock concert. The Riverview campaign calls on its comprehensive array of technical and creative services, as well as its extensive inventory of state-of-the-art equipment to provide all lighting, audio, and video equipment, onsite technical support for any AV related needs, and management of the delivery of all content to LED walls and displays throughout the exhibit. Riverview began work on the AAOS campaign nearly a year in advance with a comprehensive rigging and engineering analysis. From there, they designed the support for all hanging elements, ranging from lighting, LED and audio systems, to exhibit signage and headers weighing in excess of 10,000 lbs. “Adding the moving LED walls, together with automation that syncs the content pieces and the LED movement, takes this year’s initiative to a level well beyond what has been done previously,” Williams notes. 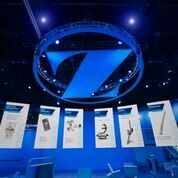 In total, the Zimmer exhibit booth is 170’ x 110’ and nearly 28,000 square feet of usable floor space, consisting of two floors accommodating conference rooms, product displays and demonstration labs. The overall system, including truss and hoists, weighs over 46 tons. The AAOS 2016 Annual Meeting exhibit hall is open March 2- 4, at the Orange County Convention Center, Orlando Florida. For members of the press attending AAOS and interested in meeting Evan Williams for an exclusive, behind-the-scenes tour of the creative and technological aspects of the Zimmer Biomet booth (booth #3245), please contact Vicky Gray-Clark or Ray Ecke to schedule a booth appointment, or feel free to drop by as time permits. For those not attending the show, phone/Skype briefings with Williams are also available upon request. Riverview Systems Group provided extensive production services to the Zimmer Biomet booth at AAOS 2016 including an automated LED wall that moves together and breaks apart depending on content. For client Zimmer Biomet's exhibit at AAOS 2016, Riverview Systems Group collaborated on a 16’ x 48’, 6-section automated LED wall and immense lighting rig akin to an arena rock concert. Riverview Systems Group designed the support for all hanging elements at the Zimmer Biomet booth at AAOS 2016. 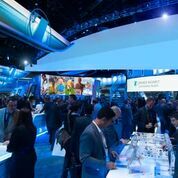 The booth is the largest at the show with nearly 28,000 sq ft. of usable floor space.Riverview production design services included support for lighting, LED and audio systems, to exhibit signage and headers weighing in excess of 10,000 lbs.